Spray paint all of our boxes with graphic Shipping Stencils, perfect for boxes, packages, factories, and warehouses. 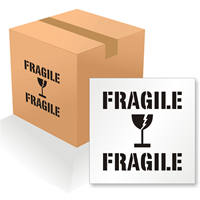 More durable than labels which may detach or get physically damaged due to rough handling or weather-abuse over time. Check out our gallery with messages like 'Fragile', 'This Side Up', 'Keep Dry', 'Handle With Care', and more. • Durable, reusable 60 mil LDPE polyethylene stencils are easy to clean after painting or spraying. • The insides are polished and burr-free for a perfect image, every time. Once you choose your stencil, order some standout stencil ink in a variety of colors.